Basically we differ between contents of the tree structure (called pages) and the real contents like text and images et cetera. The pages are structured in different levels. It can be built up to unlimited levels. 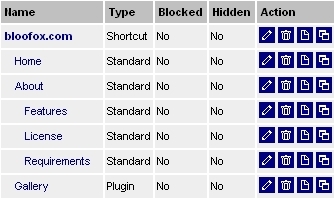 The first level is reserved for the root pages of each project configuration. All pages underneath a root page are a member of that project configuration. The second level is used for the main navigation panel. All higher levels can be seen in the submenu. Each page is saved by a clear entry no. and knows its parent entry no. The entry no. is also used to identify the pages in urls (e.g. index.php?page=5). In an other field of a page record there is a sorting no. which is appropriate for the order of the pages of the same level.